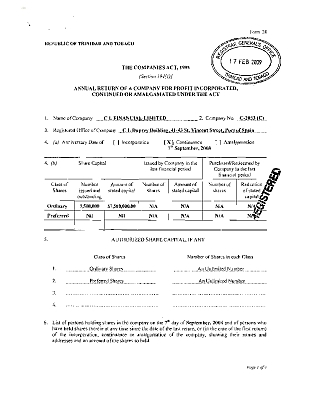 This is the official copy of CL Financial’s Annual Return from the Companies Registry, as at 17th February 2009 – it bears the official stamps and is signed by CLF’s then Corporate Secretary, Gita Sakal. The company had a paid-up capital of $7.5M, with that number of $1.00 shares in issue. The 325 shareholders are listed alphabetically, as at 7th September 2008, with details of their occupations and addresses also supplied. Of course, that list shows, at #289, the then Minister of Finance – Karen Nunez-Tesheira – as Karen Tesheira, Attorney-at-Law – holding some 10,410 shares. I am taking that to mean that Lawrence Duprey had under his direct control a maximum of 3,701,313 shares – i.e. 49.35% of the group’s entire shareholding…slightly less than half. I am leaving it to the better-informed readers to help fill in the gaps in this story. As to Andre Monteil, the recently-retired Group Finance Director, his 337,269 shares were transferred from Stone Street Capital Limited to First Street Capital Limited on 31st March 2008, the date he retired from the CLF group. Both companies’ registered address is the same – 33b Perseverance Road, Haleland Park, Maraval. It is my understanding that “British American Insurance Company – Employees Pension Plan” is a misnomer. It is supposedly controlled by Lawrence and Roger Duprey.